The Eden Drive allotment site comprises an area of 1.07 hectares (or 2.64 acres) which equates to 35½ ten pole plots, many of which are split into smaller segments. At the last count there were about 90 members registered at the site. Some plots are worked jointly by couples, in which case each is a member. There is a shed at the site where limited stocks of compost, canes, netting and other allotment essentials are available for the convenience of and purchase by members at reasonable prices. The shed is open on Sunday mornings. Sunday mornings are also the occasion for site members to offer their services in doing various essential jobs around the site – mowing and strimming the paths, etc – and, on the first Sunday morning of each month, members gather for a bring-and-share coffee break. Once or twice a year, site members and friends enjoy a communal barbecue, with contributions reflecting the ethnic and cultural diversity of the membership (as does the variety and range of crops grown on the site). 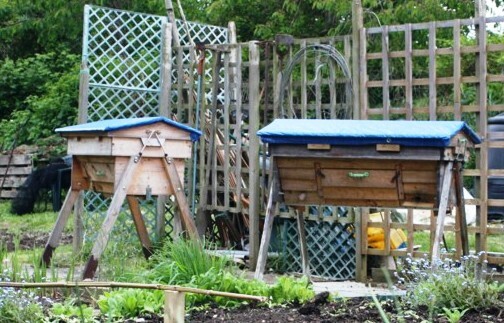 A few years ago, with the permission of the site Field Secretary, one of the site members introduced beehives onto her plot. She has taken the ‘natural beekeeping’ approach using home-built hives based on the Kenya top-bar design. Using this method, the bees build their combs suspended from bars, as opposed to the standard ‘National Hive’ whereby bees build comb on frames. The aim is to encourage bees and to provide pollinators rather than to yield a harvest of honey, which is needed by the bees over the winter (where honey is taken, the bees have to be fed with a substitute). Honey left over after winter has passed, however, is fair game. 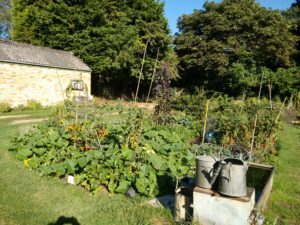 Each week during term-time, a group of youngsters from New Marston Primary School walks to the site up the steep hill from the school on Copse Lane and, on a plot set aside for the purpose, is introduced to the joy of growing things. For many children brought up in an urban environment, this is a completely new and eye-opening experience. Let us hope some of them become imbued with the Titchmarsh spirit! There are toilet facilities on site for the use of members as well as strategically placed water troughs to facilitate the watering of plants in dry weather and recently, with the help of a grant from Oxford City Council, plastic water tanks have been installed at the back of the shed to capture rain water. The City Council has also provided grants to erect fencing on one side of the boundary, which is currently ‘work-in-progress’. Key to the smooth running of the Eden Drive site is the role of the Field Secretary, John Lardner, supported by a site committee which meets regularly to discuss and make decisions about the running and maintenance of the site. The site operates a refundable deposit system for issue of keys to the ‘allotmenteers’.